A striking portrait of The Monster in a pensive mood. 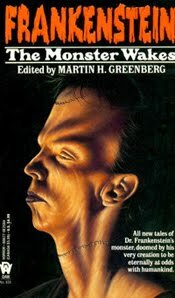 The painting, by American artist Jim Warren, served as the cover to The Monster Wakes, a 1993 anthology of new stories on the Frankenstein theme, edited by Martin H. Greenberg. It must be noted that Jim Warren’s soft-focus illustrations and portraits, as delicate as airbrushed art, are all painted with traditional brushes in oils on stretched canvas, attesting to the artist’s exquisite control of the medium. 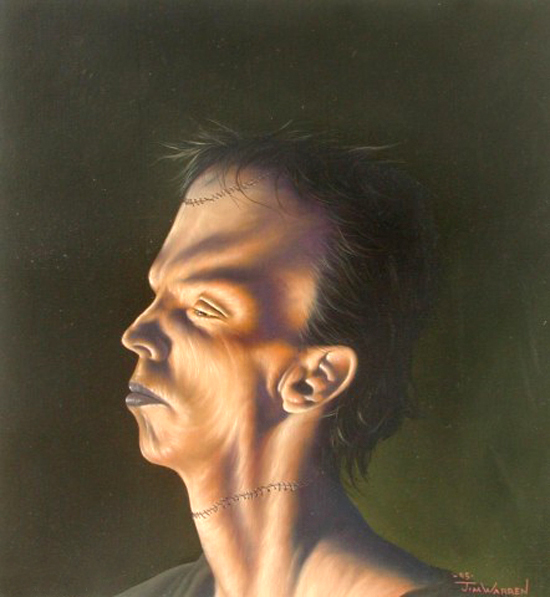 Warren has painted over 200 book cover illustrations, many of them in the fantasy, science fiction and horror genres, as well as numerous album covers and film posters. He currently paints nature scenes and elaborate celebrity portraits. A wide selection of Mr. Warren’s art is displayed on his website.